We do what we do in marketing to drive incremental sales. It’s not the views, the re-Tweets, the Likes, or even the snickers that pay the bills or keep us employed. We have to increase turns and boost margins. I bring this up because every story I wrote about in Killing Giants: 10 Strategies to Topple the Goliath In Your Industry was a money-maker. That was a purposeful filter in the research phase. Showcasing hilarious viral campaigns that never moved the needle is a waste of your time as a reader at best and a dangerous diversion of your time and resources at worst, the sort of distraction that can derail a marketing budget and a career. Do things that make money and you’ll have allies stacked up in the board room. Fail to do this and all the pithy stories and page views in the world won’t save you. 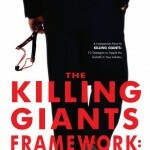 I wrote the mini-e-book, The Killing Giants Framework: 3 Areas of Excellence That Define How Davids Topple Goliaths, and published it up on the Kindle storefront to share a few learnings from my 2 years speaking and consulting around the ideas in the original work. I included new interviews, too, with leaders in their respective fields that continue to inspire me. Mark Dixon, the CEO and founder of Regus, the largest office space on demand provider in the world, discusses how he changed the definition of real estate. Kevin Packingham, the Chief Product Officer of Samsung North America, tells us how a $188 billion global brand can compete on speed. But the last interview, with Jabra North America president Pete Fox, discusses how we applied the Killing Giants Framework in real life, for fairly high stakes, and delivered an incremental $20 million in pipeline sales to this leader in communications headsets. Read about the backstory here at Brand Connections. Download the podcast with the full interview here. It’s worth a listen just to hear Pete talk about how it all came about and what this point of view-centric approach has done for his company.